Our system has identified this post as possible spam; please review carefully. Being a well formatted 0 score question I thought it was a test, so I clicked the link provided in the review, which linked to a +6 score question, before I actually complete the review. Then I completed the review with Looks OK. Seeing most audits are concealed appropriately, and a simple click to the link can ruin this one, I started wondering how effective some audits are. Even a review bot (removed that since it caused confusion, my point was that it's too easy). Anyone could "click" the link and mindlessly pass this test. Is it possibly a bug in the audit creation system, or is it a situation that wasn't predicted? Note: The "Our system..." message is irrelevant. It matters not if it is present or not. Yes, you are correct, the audit system is exploitable. 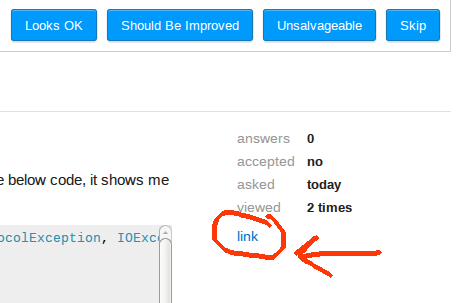 You can indeed visit the question by clicking the link (or even clicking the question title). And by doing that you'll never fail any audit, ever. It is not a problem at all because the audit system was not designed to catch the reviewers that are prepared to visit every question from an review to verify the correct action required. Worst what will happen, I think, is that those users will gain badge while being poor reviewers. We use fake questions for audits This would make it harder to exploit but if the search enginge doesn't find the question it probably is an audit so still exploitable. Creating such audit might be more difficult than the automated proccess it currently is so we might have scaling issues with this as well. We could keep track if a user visits a question currently locked for them in the queue. This could be an option with a price for the hardware and resources needed but still not failsafe. With a second account, second IP still an exploit is possible. And legit users that want to take extra action on a question (voting, editing, answering, commenting, delete voting etc) are directly impacted by this. What really remains is the question if the audit system was and is designed to be non exploitable? And the answer to that is no. There are users and by defintion that is not you nor me, nor all users that participated in this question, that don't care about audits and simple click looks good / no action needed. Mindless reviewers. For those users the audit system does its job. They are stopped and now and then one is brave (or not smart) enough to come to meta and complain about a failed audit. And now and then a high-rep, involved user gets tricked by an audit. As long as reviewing doesn't give you more than a few badges it is not a big deal. As soon as reputation can be gained this way we are in a different ball-park. And to be clear: We need people who want to review and moderate those queues. If you make the life miserable of the sheer amount of users that take on this task day after day because you implement features to catch a few robots that get a badge by cheating I would say development resources are focused on the wrong group. - Are the suggested edit audits too easy? Congratulations! You passed the audit. No, seriously. The point of the audits is to make sure people are paying attention in review. The probable spam warning is the sort of thing that might cause some people to turn off their brains and blindly spam-flag stuff. The system grabbed a known-good question as an audit, and it having the warning specifically made sure you were doing what the warning says; reviewing carefully. The fact that you even thought to click on the link to look at the question strongly suggests that you were paying attention and not just "robo-reviewing," so it seems like the audit worked. It was checking to see if you were paying attention, and you clearly were. Incidentally, you can click on the title to view the question (not just the link). Sometimes I'll do that for questions I'm not sure about (or ones that look like they may be an audit). Audit in review queue: I see you! This review audit should really be marked as spam? Why was this suggested edit approved? Why am I getting “Our system has identified this post as possible spam” in review audits? Why did the system identify this audit as possible spam? Is there a flaw in audits or am I missing the point?